Due to the many ranges and functions available in a DMM, only the basic accuracy is indicated for reference. Please refer to the individual catalogs for detailed accuracy information. 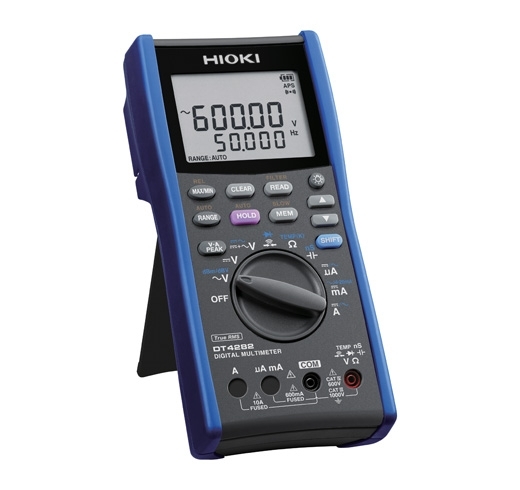 DC Voltage 60.000 mV to 1000.0 V, 6 ranges, Basic accuracy: ±0.025 % rdg. ±2 dgt. Basic accuracy: ±0.03 % rdg. ±2 dgt. DC Current 600.00 μA to 10.000 A, 6 ranges, Basic accuracy: ±0.05 % rdg. ±5 dgt. C (capacitance) 1.000 nF to 100.0 mF, 9 ranges, Basic accuracy: ±1.0 % rdg. ±5 dgt.